We started the trip leisurely on Christmas Eve from San Jose and took I-5 down to Los Angeles and arrived at Hollywood 5 hours later. We checked into the Hollywood Heights Hotel, decent facilities but great location, 2 blocks from Hollywood and Sunset Blvd. We walked on Hollywood Blvd. retracing the steps of the many famous stars and celebrities. During award ceremony season, Hollywood Blvd. turns into a glitzy red carpet venue, but on Christmas Eve, it was just tourists, and different characters in costume. Kodak Theatre, Grauman’s Chinese Theatre all seemed very ordinary without the flashing lights of the paparazzi. The tourist stretch of Hollywood Blvd. extends for 3 blocks and the rest is not worth seeing. Dinner was at Rahel, in Little Ethiopia and true to LA style, it was a Vegan restaurant. After dinner, we drove to Rodeo Drive, and though the shops were closed, we window shopped as much as we could. I guess it wouldn’t have made a difference even if the shops were open. On Rodeo Drive, a small section called Via Rodeo, is paved with cobblestones and pedestrian only. This felt like the LA we see in movies. We continued our drive into Beverly Hills and Bel-Air, doing our own Bing powered celebrity house spotting. The houses were on huge plots, with winding driveways, large iron gates, tall trees and hedges. It was truly luxurious. Beverly Hills is the neighborhood with the highest median home price in the US and it showed. Day 2 began with a very unsuccessful hunt for an open breakfast joint in Beverly Hills and Hollywood. We settled for Starbucks, although it was the one in Beverly Hills. The disadvantage of not finding anything open on Christmas day was our boon for the whole day as the feared LA traffic was non-existent. We drove into downtown Los Angeles, and walked around the Walt Disney Concert Hall and the Staples Center. The concert hall was designed by Frank Gehry as can be easily seen in the sweeping free form architecture. We then drove to Malibu on the Pacific Coast Highway, and found Cher’s, Charlie Sheen’s, Julie Andrews’ and Bob Dylan’s house. We continued on the PCH to Santa Monica, stopping on beaches along the way. Santa Monica beach, made famous by Baywatch was crowded even for a holiday. Route 66 also ends in Santa Monica. We continued our trip down the Pacific coast to Venice. Though man-made, the canals and the million dollar homes on the canals were beautiful and the walk to the beach was relaxing. We had lunch at Venice beach and then drove to Marina Del Rey, our last stop on the PCH for the day. We reversed our route, heading back north through Los Angeles to Pasadena to check out the Rose Bowl, just days ahead of the Big Ten battle with TCU. Penn State might struggle to come here, but 3 Penn Staters made up for it. Following the advice of a few friends we headed back to Los Angeles, to find gourmet pizza at Mr. Pizza, a very dimly lit pizza joint. Good LA pizza but Chicago still reigns supreme. Day 3 began in true LA style with breakfast at Barney’s Greengrass, on the terrace of Barney’s in Beverly Hills. We could see all of Beverly Hills and the iconic Hollywood sign from our breakfast table and the food, the Banana pancake transported into the world of celebrities. Expensive but what isn’t in LA. We spent 2 more hours shopping and then headed out south on the PCH. The drive was one of the most scenic we have been on. The Pacific ocean on one side and the flowing mountains and hills on the other. The road wound its way through canyons and the weather played along as all the storms and mud slides from the week prior had disappeared. The road into Laguna beach was closed but we found a detour through Newport beach. Laguna beach and Newport beach all form part of Orange County or OC as it is affectionately called. The whole stretch of OC is one of the must see places in the US. Different, green, blue, and truly scenic. 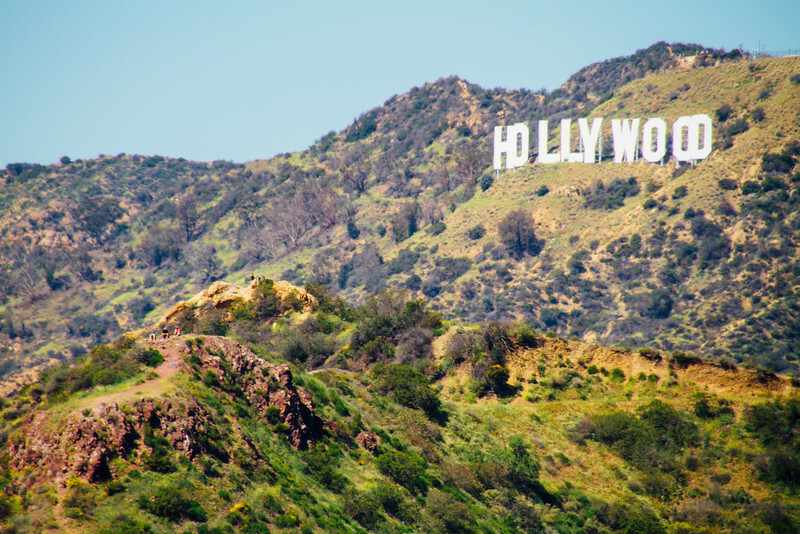 Detour – though we did this on another trip, it is a must do in Los Angeles; a drive up to the Griffith Observatory. Griffith Observatory sits on the south-facing slope of Mount Hollywood in Griffith Park. It commands a view of the Los Angeles Basin, including Downtown LA to the southeast, Hollywood to the south, and the Pacific Ocean to the southwest. It is a popular tourist attraction with an excellent view of the Hollywood Sign, and an excellent museum too. We arrived in San Diego a few hours after sunset, after a scenic drive from Los Angeles, passing through Orange County. Our hotel for the first night was the Hotel Solamar, a luxury Klimpton hotel in the heart of the Gaslamp Quarter. The area is listed as a historic district on the National Register of Historic Places as Gaslamp Quarter Historic District. It is one of the most vibrant areas in San Diego, and very hip. We spent the evening walking around the National Convention Center and the historic district and decided to get dinner at a French Bistro. The next morning we headed to the highly talked about Cafe 222. Bobby Flay had visited this breakfast joint and labeled their Banana and Peanut Butter French toast as one of the best things he ever ate. Not quite the same sentiment but certainly delicious and worth the wait and the cold outside seating. It did take us a while to get going again but we did and headed north of the city to La Jolla an affluent, hilly seaside resort community, occupying 7 miles (11 km) of curving coastline along the Pacific Ocean in Southern California. We headed to the La Jolla beach, a haven for surfers. At first glance the sheer number of surfers made us believe they might be seals but as we saw each stand and ride the waves we knew this would give the surfers in Hawaii stiff competition. La Jolla Cove is popular for swimming, scuba diving and snorkeling. However, since La Jolla Cove is within the San Diego-La Jolla Underwater Park (a marine refuge area), swimming devices such as surfboards, boogie boards, and even inflatable mattresses are not permitted, and this rule is carefully enforced by the lifeguards, specifically in the part of the area defined as the Ecological Reserve. Just a short swim away to the right on the coast is “Sunny Jim Cave,” a popular destination for tourists. It is also accessible from a nearby store, which charges a nominal fee to go down a staircase leading to the cave. From La Jolla we headed to Mission Bay, a docking port for hundreds of boats. Swimming among the boats were seals. Mission Bay is a salt-water bay or lagoon located south of the Pacific Beach community of San Diego, California. The bay is part of the recreational Mission Bay Park, which is the largest man-made aquatic park in the country, consisting of 4,235 acres, approximately 46% land and 54% water. Next stop was the Cabrillo National Monument, located at the southern tip of the Point Loma Peninsula in San Diego, California. It commemorates the landing of Juan Rodríguez Cabrillo at San Diego Bay on September 28, 1542. This event marked the first time that a European expedition had set foot on what later became the West Coast of the United States. We had never been to Mexico but from this southernmost point we could see Tijuana. As with all historical units of the National Park Service, Cabrillo was listed on the National Register of Historic Places on October 15, 1966. The park is also a great vantage point to see San Diego skyline, Coronado Island, and the San Diego Bay. We headed from the park to North Bay to catch the last Harbor cruise. The San Diego Harbor Cruise, especially the last one that overlaps with sunset is one of the best ideas. Outward bound you can catch the sunset in all its glorious colors reflecting against the San Diego skyline. Heading back into San Diego, you can see the sky turn shades of pink and purple and the ships in the San Diego Naval Base are majestically silhouetted. Back in San Diego, we had dinner in Rama, a Thai restaurant with high ratings but we were very disappointed. The food was decent, but the service was frustratingly below par. Not recommended. To make up for the bad dinner we headed to Extraordinary Desserts, a highlight of our trip. It’s her never-compromise-on-quality mantra that has made Karen Krasne, owner of Extraordinary Desserts, the quintessential dessert chef. Trained in Paris, Krasne believes that sublime pastries should be as luscious to look at as they are to taste. The unique patisserie, located near downtown San Diego, ices & decorates its way through mounds of chocolate and gallons of whipped cream each week. The next morning, we woke up at the Marriott and headed to another famous San Diego joint, Bread and Cie. The bread, croissants and sandwiches were perfect, flaky on the outside and chewy on the inside. We took our food to Balboa park, a paradise nestled in the middle of San Diego. The Park is named after the Spanish maritime explorer Vasco Núñez de Balboa. It was the location of the 1915 Panama-California Exposition and 1935 California Pacific International Exposition which each created architectural landmarks for the Park. Balboa Park’s site was placed in reserve in 1835, and so is one of the oldest sites in the United States dedicated to public recreational use. Besides open space areas and natural vegetation green belts, it contains a variety of cultural attractions including many museums, theaters, gardens, shops and restaurants, as well as the world famous San Diego Zoo. Balboa Park, and the historic Exposition buildings, were declared a National Historic Landmark and National Historic Landmark District in 1977, and placed on the National Register of Historic Places. Many of the park’s cultural attractions are along El Prado, a long, wide promenade and boulevard running through the center of the park. Most of the buildings lining this street are in the Spanish Colonial Revival architecture style, a richly ornamented eclectic mixture of European Spanish architecture and the Spanish Colonial architecture of New Spain-Mexico. Two days in San Diego, we scratched the surface and saw the highlights. We will be back.